One of the most visible, and perhaps even iconic, features of a super energy-efficient home is the heat recovery ventilator (HRV). These devices remove stale air from the home and replace it with pre-heated air from outside. The result is better indoor air quality and lower energy use than standard homes. The HRV itself is fairly simple: an air-tight box with a heat exchange core that transfers heat from the indoor air to outside air as it passes through the box. The box also contains two small fans to move the air. All the points below apply equally to HRVs and their close cousins: energy recovery ventilators (ERVs). This is the second of a two-part series on HRVs based on training developed by Bruce Manclark and Dan Wildenhaus of CLEAResult. Part 1 covers proper equipment selection. Heat recovery ventilators (HRVs) have been used in homes and commercial buildings for many decades, mostly in colder climates. They provide fresh air and distribute it throughout the building. Most experts would agree that it’s best for an HRV to have ductwork that is properly sized and located for its own use. This dedicated system generally offers the best efficiency, health, and comfort. However, most homes in North America use a forced air heating and cooling system that also has an elaborate system of ductwork to move conditioned air to all the rooms. It makes sense to use these same ducts to distribute fresh air. Integrating the HRV with the forced-air system reduces the amount of dedicated ductwork needed which slashes material and installation cost. Plus, fresh air is more quickly and evenly distributed throughout the home. In the past, some integrated systems have achieved limited success due to installation issues. According to Manclark, integrated systems can work well if properly planned and installed. The key is a smooth connection between the two duct systems and proper controls. Always connect to the forced air supply ductwork, not the return. Always use the injection port design (see below). Buy an electrically commutated air-handler motor. Pull exhaust air from bathrooms. While some of these rules are self explanatory, we’ll elaborate further on a couple of them below. Golden Rule #2: Always use the injection port design. The injection port is a an adjustable elbow pointed downstream inside the furnace’s supply plenum. Manclark used this test apparatus to visualize how air from the HRV would flow into the furnace supply plenum. This is Manclark’s big innovation. The large blower in the air handler is six to ten times more powerful than the much smaller fans in the HRV, so it’s critical to create a smooth convergence where the air streams meet. Manclark suggests attaching the HRV duct, which is usually six inches in diameter, to the air handler’s supply trunk using a 90 degree elbow pointed downstream. Airflow inside the supply trunk surrounds the elbow supporting the weaker HRV stream rather than fighting it. In the past, some installers have shown a preference for inserting the HRV supply into the air handler return trunk. The idea is that negative pressure – or suction – in the return pulls air through the HRV. Manclark takes the position that this arrangement creates large pressure imbalances and leads to over ventilation. Golden Rule #4: Buy an electrically commutated air-handler motor. You have to move a lot of air to carry heat, much more air than is required to simply provide fresh air. “The large blower in most air handlers can move up to 1500 cfm and generate a considerable amount of air pressure within the ducts” said Wildenhaus. “The typical motor driving an air handler’s blower requires a lot of power, up to 650 watts.” In contrast, HRV fans are much smaller, generally rated for 100 to 300 cfm and draw 150 to 400 watts. Using a large air handler blower with a single set speed to move a small amount of fresh air makes no sense. An electrically commutated motor (ECM) in the air handler solves this problem. It is inherently more energy efficient, and more importantly, it can be controlled to run at many different speeds. At the lowest setting, a 16-pin ECM would typically draw only 40 watts. “This is not the ECM called an X-13,” cautions Wildenhaus. “To gain this level of efficiency, be sure to get the 16-pin ECM.” While an ECM is a great efficiency upgrade for any air handler, it’s an absolute necessity when using a forced air system to distribute ventilation air. In addition to Manclark’s five Golden Rules for HRV integration, the controls of both systems need to cooperate. Manclark offers three options. Option 1: Configure the HRV and air handler to both run continuously while a smart controller boosts the flow of the air handler fan when heating or cooling is needed. At the lowest speed it can move enough air for sufficient ventilation while consuming as little as 40 watts. This is far lower than a typical single-speed furnace blower that can consume as much as 650 watts. This option distributes fresh air while reducing the energy use and noise of the air handler. It also allows fresh air, which is generally colder, to mix with house air for a more comfortable temperature. Option 2: Choose an HRV that has dampers that open only when ventilation is called for, or add them in the field. The air handler can operate normally, because the dampers control the flow of fresh air from the HRV. This prevents air from flowing in reverse through the HRV when the air handler is on, but the HRV isn’t. The HRV controller operates the air handler’s blower when ventilation is engaged. Some HRVs come with backdraft dampers built in. Option 3: Interlock the HRV controls with the air handler blower so that the air handler cannot run without the HRV. The controls must be set properly to operate both systems so that the HRV runs during calls for heating or cooling, as well as calls for the air handler to run whenever the system calls for ventilation. This option maximizes distribution with every call for ventilation, while ensuring that all heating and cooling runs integrate ventilation. In this case it’s best to choose an HRV sized properly for the basic whole-house ventilation required – nothing more. In other words, don’t oversize the HRV so it can be boosted to high speed to clear bathrooms quickly. Use a smaller HRV along with spot ventilation fans in bathrooms. As with all ducted systems, it’s crucial to run the ducts inside the building’s conditioned space. Then be sure to place a copy of this record in the owner’s manual. It’s a good idea to label the ducts, wires and controls for future reference as well. Good indoor air quality is essential for all homes whether or not they have air handlers. HRVs and ERVs are the gold standard of effective, efficient ventilation. But achieving the full benefits of HRVs requires careful equipment selection and installation for specific ducting systems. For more details, see the HRV System Best Practices Poster at BetterBuiltNW.com. Can this system work without intergrating the hrv with the air handler. Can the supply air from the hrv make it’s way through the supply duct work alone. I’ve been told that lowest possible setting of a air handler that I can use would run at 575 watts of power ( forgot to ask about the cfm output at this setting but I’m guessing far more then I need. The reason being I have a 4 tonne air conditioner and need a certain size air handler to move my cold air in the summer months. 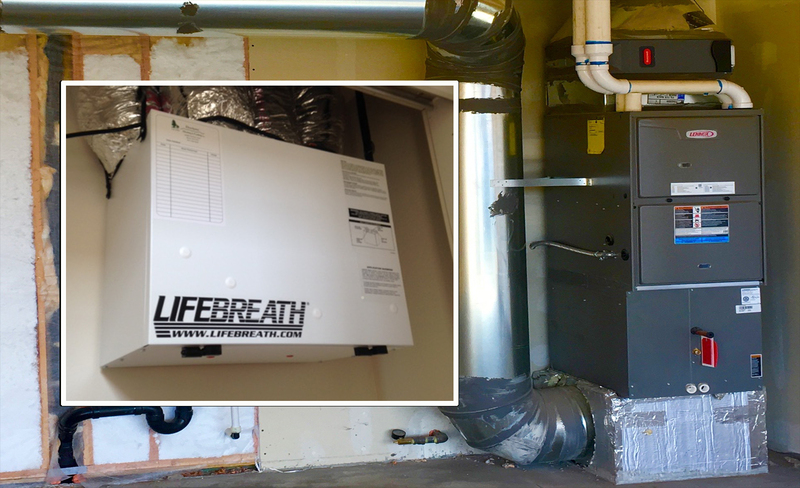 It’s best to install an HRV or ERV that has a completely independent duct system. This was described in Part 1: Six Steps to Success with Heat Recovery Ventilation. Most HRVs run between 80 and 200 cfm, while an air handler may be moving 1200 to 2000 cfm at high speed. However, you make is an excellent point for situations where ductwork is already in place. Why not use it to distribute fresh air? To accomplish this you’ll need a savvy HVAC technician. It can be done but must be done carefully. By following the recommendations in this blog post, you can successfully integrate the two systems. As you mentioned, a key issue is fan speed. Air-conditioning (cooling) requires the highest speed. Heating requires a lower speed. Fresh air ventilation needs the least air flow and therefore the lowest speed. Since the typical installation never uses the lowest speed, technicians are not always familiar with using it. Furthermore, you should use a 16-pin, electrically commutated motor (ECM) as mentioned in Golden Rule #4 above. Show this blog post to your HVAC technician and enjoy highly-efficient fresh air ventilation.